Oh, your Rose Stars are beautiful. They are going to make a fabulous quilt! 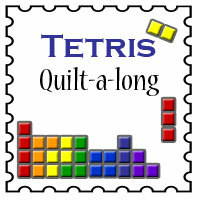 And the Tetris colours are great too! Your Rose Stars are looking so fabulous, Lucy!! Oh I cant wait for your rose star quilt! Dude can we do wordless Wednesday every week? Lovely stars Lucy. And your Tetris blocks are super cute! The stars are so pretty! I really like how you have a single obvious print for the Tetris block! It stands out so well. I love those rose stars! They are going to make such a pretty quilt! That paper piecing! Just wow! oh my those rose stars are gorgeous!! The rose stars are beautiful. I may have asked you this before - did yu draw your own templates or get the off t'interweb? Soooooogorgeous Lucy - love your rose stars! Your EPP is just delicious! I love watching this develop! What a beautiful blog! Love the Rose Star blocks! Eep! I need to take a Rose Star pic like that. PLUS I'm in love with your wordless WIP Wednesday. I would have been in bed like half an hour earlier if I'd gone Wordless yesterday ;-) Those Rose Stars look amazing, and I'm loving the color block situation. Those rose stars made me gasp - they are fab. No words required - gorgeous!! Lucy! These stars are fantastic! I absolutely love them! I have developed an addiction! Pile on the WIPs and a little plea for help!